Christmas is always a magical time of year. This season, bring even more wonder to your holidays by gathering the family and stepping inside a classic Christmas tale at Branson's Scenic Railway. Van Allsburg’s “The Polar Express,” the renowned story and 2004 film about learning to cherish and believe in the spirit of Christmas, comes to life each Christmas at Branson’s Scenic Railway. In the timeless Christmas story, a boy travels all the way to the North Pole on a special train ride to challenge his doubts about the existence of Santa Claus. 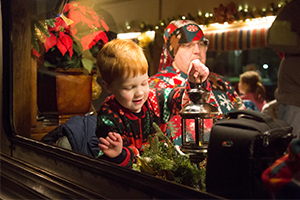 After boarding an authentic locomotive at the 1906 Branson depot, visitors to The Polar Express will experience a similar journey. Original character reenactments, a visit with Santa himself and a reading of the book during the train ride are all part of the package. All passengers receive hot chocolate and cookies to snack on during the train ride, and families are encouraged to dress in pajamas – just as the young passengers in the original story! Train rides aboard The Polar Express in downtown Branson occur on select dates through November and December. Departures are at 4:45 p.m., 6:30 p.m. and 8:15 p.m. Tickets sell out very quickly, so be sure to call in advance at 1-800-287-2462, or reserve seating online at www.bransontrain.com. A ride aboard The Polar Express in Branson will remind kids (and adults!) how wonderful and special the holidays are … if you just believe!